Pretexting, by definition, means a reason assigned to justify an act, which have only the appearance of truth, and which are without foundation; or which if true are not the true reasons for such act. In other words, a false reason or motive put forth to hide the real one. Pretexting is a powerful tool and for a person to become an effective investigator, it needs to be mastered. An investigator is required to do more than just arbitrarily report information. An investigator is expected to get answers. It is the responsibility of the investigator to know the case objectives and to know what pretext(s) would be most effective to ascertain the necessary information. For a pretext to work, it must be believable and needs to be delivered with confidence and without hesitation. An investigator should conduct all pretext efforts just as an actor or actress in character. As an actor or actress, an investigator must know his or her part. As you will find out quickly in the investigative community, pretexting is a skill that can quickly enable you to rise to the top of your profession. However, if abused, pretexting can cause irreparable harm to you, your case and your client. In insurance investigations, there are considerations beyond the Gramm-Leach-Bliley (GLB) Financial Services Modernization Act, which include whether the state has adopted the National Association of Insurance Commissioners (NAIC) Insurance Information and Privacy Act (NAIC Model #670) and relevant case law. Insurance companies are regulated by the individual states in which they conduct business. When a state adopts the NAIC Model Act, it becomes state law. No insurance institution, agent or insurance support organization shall use or authorize the use of pretext interviews to obtain information in connection with an insurance transaction; provided, however, a pretext interview may be undertaken to obtain information from a person or institution that does not have a generally or statutorily recognized privileged relationship with the person about whom the information relates for the purpose of investigating a claim where, based upon specific information available for review by the Commissioner, there is a reasonable basis for suspecting criminal activity, fraud, material misrepresentation or material nondisclosure in connection with the claim. If the claimant resides in a state that has adopted this Model Act, and there is “a reasonable basis for suspecting criminal activity, fraud, material misrepresentation or material nondisclosure in connection with the claim,” then it is legally feasible for the carrier to authorize a P.I. to use some type of pretext. However, state laws may vary so it’s important to know the specific spin to the law in your jurisdiction. For example, Minnesota’s insurance code does not have the exceptions for a “reasonable basis for suspecting criminal activity, fraud, material misrepresentation or material nondisclosure in connection with the claim”; therefore, pretexting in the State of Minnesota to gain information relevant to an insurance claim is illegal. 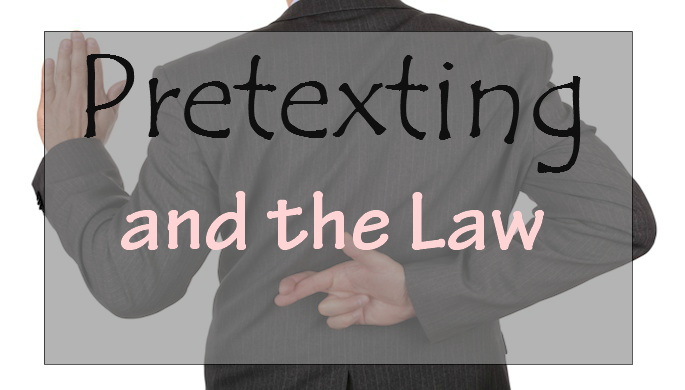 Any company pretexting policy must ensure that pretexting is conducted in a legal and ethical manner with good faith and fair dealing. In the event that, pursuant to a client’s instructions, there is to be no contact made with claimant’s or pretext used of any sort, this requirement must be added to the client’s special handling requirements to avoid accidental mistakes; this ensures client instructions are always adhered to. Our investigators are trained to use pretexts on individuals we have reason to believe have information pertinent to our investigation but would not knowingly or willingly reveal it for our purposes. Our Investigators are required to be familiar with laws pertaining to utilizing investigative pretexts. Never represent yourself as a government employee, law enforcement officer, clergyman, employee or member of an actual company. All information investigators have gathered shall remain confidential. Do not reveal personal or intimate information about the subject to individuals having no right to such information. Never use your correct name or leave your telephone number. Never pretext to gain information from financial institutions. What information they are trying to obtain? What they will need to hear before giving up the information? Investigators must not only use a believable pretext, but the proper person must be employed to execute the pretext. As discussed earlier, the investigator is like an actor and they must be suited to the role. It is important the investigator’s believe-ability be without question from the first moment of contact until the pretexted person forgets the conversation ever occurred. Investigators must be taught to have a well thought out pretext with answers to questions that may come up during their presentation. Investigators must plan an opening remark. If their opening remark is well thought out and believable, it sets the tone for a successful outcome. Be friendly and be yourself. Few people will ever get away with using a spurious accent or appearance. Size up your subject early for evasiveness or suspicion. Never force the issue if someone won’t talk. Thank the person and discontinue the conversation. When a client assigns an investigation, they are looking at the very least for insight into the actions of their subject. More insight than they had before they assigned the case to you. With that said, it is important to use pretexting in a reasonable manner to gather intelligence that can assist in forwarding the investigation. It should be noted, unless otherwise dictated by law, most cases will require some level of pretexting, if for nothing else to ensure you are investigating the correct person. However, and just as important, if there is no need for a pretext (you have a photo, there is a scheduled medical appointment, etc. ), administering an elaborate pretext is considered unprofessional and borders recklessness when it comes to the care of the assignment you were trusted with. In the last eighteen years in the investigative community, there have been massive changes to the industry; however, one thing has certainly remained the same. If your investigation is REASONABLE, if your decisions are REASONABLE, and if your actions are REASONABLE, usually, you will have no major legal issues to address with your client. As an investigator, your job it to meet or exceed an objective. As in sports, it requires a “fair” game plan, then adjustments along the way. Good Article!! I agree that mastering pretexting is the key to becoming a great investigator. However, as you said in the article, knowing when to use it is very important. Pretexting should NEVER be your first option. Some of my clients do not even allow their PI vendors to use pretexting in any States. This is unfortunate and is the direct results of large PI firms hiring inexperienced investigators who do not know what they are doing.. I personally will only use pretexts as a last resort and prefer to not use them at all. However when I do, they usually are extremely helpful. Especially with skip trace investigations.